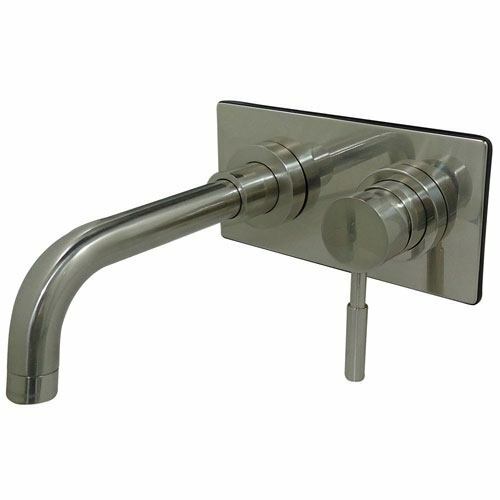 Concord Satin Nickel Single Handle Wall-Mount Vessel Sink Faucet KS8118DL: This Single Handle Wall-Mount Vessel Sink Faucet is built to last. The highest quality standards are used to precision manufacturer a top of the line product. Important features of this BRAND NEW Fixture: Complete Item! Everything necessary for installation is included. - Solid Metal Lever Handle - Matching Accessories Available - Easy to Install - Installation instructions included - Single Handle Wall-Mount Vessel Sink Faucet - Single Handle Deck Mount, 2 Hole Sink Application, 4-inch Centerset, 2 hole 4-inch center spread installation, Fabricated from solid brass material for durability and reliability, Premium color finish resist tarnishing and corrosion, 180-degree Joystick type control mechanism, 1/2-inch - 14 NPS male threaded shank inlets, Ceramic disc cartridge, 2 GPM (7.5 LPM) Max at 60 PSI, Integrated removable aerator, 8-inch spout reach from the wall, 9-inch overall height. - High Quality Brass Construction - 2.2 GPM / 8.3 LPM at 60 PSI - 1/4 Turn Ceramic Cartridge - Satin Nickel premier finish designed to resist fading and tarnishing. This fixture is manufactured by Kingston Brass and is part of their Concord collection. Single Handle Deck Mount, 2 Hole Sink Application, 4" Centerset, 2 hole 4" center spread installation, Fabricated from solid brass material for durability and reliability, Premium color finish resist tarnishing and corrosion, 180-degree Joystick type control mechanism, 1/2" - 14 NPS male threaded shank inlets, Ceramic disc cartridge, 2 GPM (7.5 LPM) Max at 60 PSI, Integrated removable aerator, 8" spout reach from the wall, 9" overall height.